1. Coat your vegetables in a little olive oil and cook on the grill. 2. 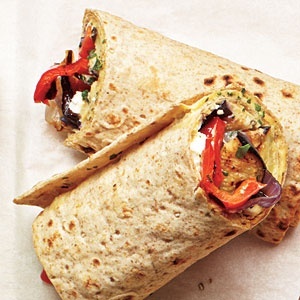 Assemble your wraps! First, spread hummus on the tortilla. Then place veggies and a sprinkle of cheese. Roll up and enjoy! Did you get this recipe from Cooking Light? I swear I saw it in the magazine.